On holiday I picked masses of comfrey, growing abundantly on the canal bank in Staffordshire. I brewed it up in the enamel pan again and the initial colour looked very promising. I left a scrap of silk organza in the dye pot while it was brewing and it came out a bright, olive green – far right in picture. I then soaked the fabrics in the dye for about 12 hours, but they didn’t come out the same kind of vibrant green. The silks mostly came out pale khaki or greeny-beige, and most of the cellulose fibres did nothing much at all – except, strangely, the overdyed Liberty lawn (pink flowers). This has never been washed so I assume there is a fabric treatment on it which has caused the reaction. Mid green-brown from a light cream fabric. Overall these are not the most exciting colours but they are exactly the kind of colours I like and use a lot, so I am very happy with them. Top left: silk habotai, filament silk thread, Liberty lawn with flowers, silk / viscose velvet beneath nicely splotchy, just how I like it, as is the linen on far right. 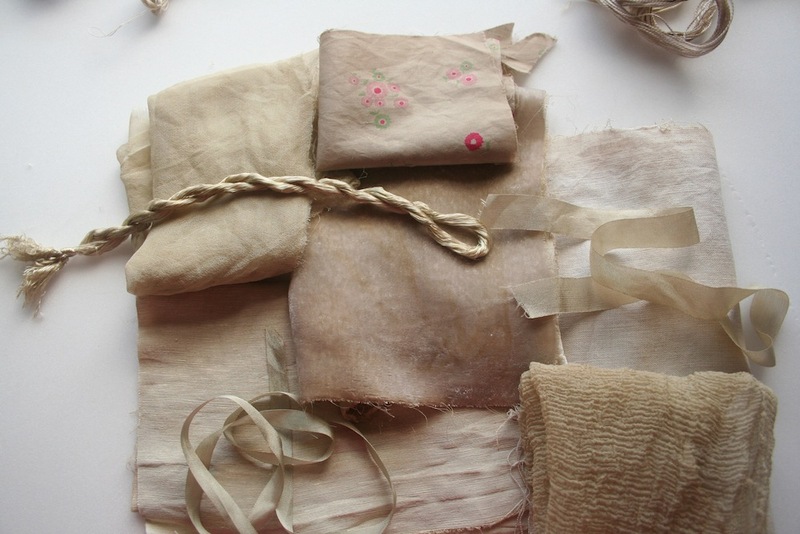 Silk chiffon, the crinkly one at the bottom, silk ribbon and hemp silk bottom left. Silk thread, at the top, just peeking into the photo came out the same kind of greenish beige. None of the fabrics was mordanted this time, so my next comfrey experiment will be. It is actually remarkably unmessy really – just like making soup. Much less messy than chemical dyes and so much better in so many ways. a beautiful range of subtle colours. Great! I should have done this months ago to promote Sunday’s Kitchen Dyes workshop… but it wasn’t the right time of year! I’ll be teaching it again next year, at some point. They are lovely, aren’t they? I get more and more into subtle colours all the time – and surprise myself!